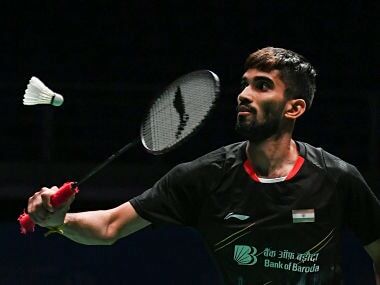 Tokyo: India's Kidambi Srikanth crashed out in the quarterfinals of the Japan Open Super Series after losing to recently-crown world champion Viktor Axelsen of Denmark but mixed doubles pair of Pranaav Jerry Chopra and N Sikki Reddy advanced to the semi-finals. 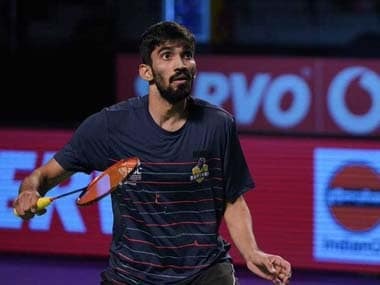 The 25-year-old from Guntur, who clinched back-to-back titles at Indonesia and Australia, couldn't curb his simple errors to go down 17-21 17-21 to World No 2 and third seed Axelsen in a men's singles quarterfinal contest that lasted 40 minutes. With this victory, Axelsen enjoys a 3-2 head-to-head lead over Srikanth in five meetings, having won the last three duels. US Open champion HS Prannoy too suffered a 15-21 14-21 loss to China's second seed Shi Yuqi in 45 minutes to crash out in the last-eight stage. But Syed Modi Grand Prix Gold champions Pranaav and Sikki kept India's flag fluttering, defeating Korea's Seung Jae Seo and Kim Ha Na 21-18 9-21 21-19 to set up a clash with Japan's Takuro Hoki and Sayaka Hirota in the next round. Srikanth made too many errors and squandered 16-13 and 9 -6 advantages in the first and second games respectively. Axelsen, on the other hand, showed great agility and used his smashes to good use to outwit the Indian. In the opening game, Axelsen opened up a 4-1 lead early on. Srikanth clawed back at 4-4 before grabbing the lead but the Dane managed to turn the tables to reach 8-6 when his opponent made a judgement error at baseline, found the net and then hit long. The Indian grabbed a point after producing a precise return on the line but Axelsen managed to make it 10-7. Srikanth once drew parity with the Dane who committed a few unforced errors but held the 11-10 advantage at the break when the Indian found the net again. Srikanth started engaging his opponent in rallies, creating some acute angled strokes and mixing it up with deception and his trademark smashes to lead 14-13. The Indian was tight at the net but he struggled with the length as the Dane once again levelled at 16-16. Axelsen won a video referral and then showed good athleticism to won a couple of points before unleashing a jump cross court smash to seal the opening game. In the second game, Srikanth played some good rallies, varying the pace and managed to lead 5-4. The Indian won a referral to reach 6-4, before extending the lead to 9-6 when his rival served out and also hit long. A miscued shot into the net from Srikanth gave Axelsen an opportunity and he capitalised on it with two precise smashes to draw parity at 9-9. Srikanth's overhead return again found the net as Axelsen again unleashed a straight jump smash to again grab a slender 11-10 advantage at the interval. Axelsen jumped to a 15-12 lead after the break before Srikanth produced a straight jump smash to break the rhythm. The Dane produced some brilliant cross court smashes and sharp slices to lead 18-14. Srikanth won two points with one of the returns kissing the net. The Indian apologised and a great sportsmanship was on display as the two high fifed at the net. Axelsen soon unleashed another jump smash to move to three match points and sealed it when he drew Srikanth at the net and then pushed the shuttle away from him with a backhand return.